Stock Split - What Does It Mean? 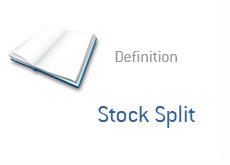 What is the definition of a "stock split" or "share split"? Why would a company decide to initiate a stock split? In this article we will be specifically dealing with normal stock splits. If you want to learn more about reverse stock splits, then simply click here. In a stock split, a company increases the total number of shares that are outstanding in the company. For instance - let's say that XYZ had a total of 10 million shares outstanding. The company then decides that they are going to institute a 2 for 1 share split. Now, instead of 10 million shares outstanding, the company will have 20 million shares outstanding. What does this mean for shareholders in the company? It means that they will own 2 shares of the company for every 1 share that they currently own. So, a person holding 100 shares of XYZ would now own 200 shares after the split had been completed. Splits don't increase the value of a company. Let me explain. Let's say that XYZ had 10 million shares outstanding and was currently trading at $10 per share. This would give the company a market cap of $100 million dollars. If the company decided to institute a 2 for 1 share split, then this would mean that there would now be 20 million shares outstanding, and each share would now be worth $5 a piece. So, in a share split, investors don't lose or gain any value in their shares. Rather, they simply own double the shares, and each share is worth half as much. The total worth of their investment doesn't change with a split. Now why would a company want to split their shares? The most common reason is that shares can seem more "affordable" to the average investor. For instance, XYZ may be trading at $1,000 per share. Many investors will automatically assume that the company's shares are "expensive" due to the fact that the shares are trading at such a high price. Let's say that the company decides to institute a 100:1 share split. Suddenly the shares will be trading at $10 each, and they will suddenly seem "affordable", even though nothing really has changed. The price of a share has nothing to do with the overall value of a company, or whether or not the shares are a good buy. Take Berkshire Hathaway. Many people feel as though shares in the company are "expensive", due to the fact that they are trading for over $100,000. Rather, this is simply due to the fact that Warren Buffett refuses to split the stock. In reality, Berkshire Hathaway may very well be a "cheap" stock, even though it trades at around $100,000 per share. Companies will announce their intention to implement a share split first, and then actually implement the split at a later date. Why Doesn't Berkshire Hathaway Split Its Stock? What is a Reverse Stock Split? And Why Is It Usually a Bad Thing For the Stock?